When it comes to residential lighting upgrades, many homeowners are intimidated by the sheer volume of styles and lighting fixtures available today. It pays to plan ahead and properly prepare for upgrading your home lighting fixtures, and it will help to create an aesthetically pleasing outcome. The Light Palace is here to serve as your local lighting store in Omaha, providing thousands of fixtures and expert advice to Nebraska customers since 1953. Our 10,000 square foot lighting showroom is here to provide all of the inspiration you need to take your home lighting to the next level! Today, we’ll continue our blog series highlighting the importance of layering, as well as covering some tips to help create amazing outcomes for your home. After you are done, be sure to reach out to our modern lighting pros for the best assistance and selection in the state! 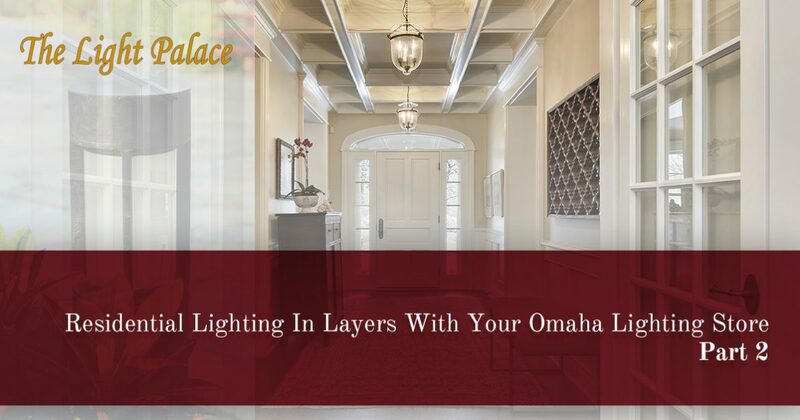 The purpose of layering is to create a comprehensive system for illuminating your home. Many homeowners get caught up in utilizing each type of lighting equally, yet it’s important to remember that your ambient downlights will provide a majority of the illumination. This gives you the freedom to choose other fixtures that come in a variety of different sizes and styles. Decorative lighting can vary in output, giving consumers more freedom to find fixtures that they truly love. Remember that your accent lighting serves to create drama and depth, so be sure to utilize elements that are bright enough to make a noticeable difference from the ambient lighting present. Task lighting can come in many forms to create stylish outcomes for the room. Fixtures that have different outputs isn’t always a bad thing; remember that equality in lighting equates to uniformity and a boring space! Making your space your own with smartly placed accent lighting fixtures. This is your home, so be sure to focus on the features that you most want to highlight. From a stunning piece of art on the wall to home decor items highlighted on shelves, the possibilities are nearly endless for accent lighting opportunities. When you are shopping for bedroom, bathroom, living room, or kitchen lighting, it’s important to be consistent or complementary in the color temperature of your fixtures. Incorporating numerous lighting elements into one room can create a dynamic outcome, but only if the intensity of each light works harmoniously together. Our indoor lighting experts can help you to find complimentary temperatures to ensure that your room is lit in a coherent and pleasant manner. When it comes to layering your home lighting, you have a wide range of tools and products at your disposal. Oftentimes, it comes down to quality planning to ensure that your Nebraska home looks great once that switch is flipped on. Next time, we’ll conclude this blog series by discussing a few more tips that can help your project. If you’re in need of advice and expert assistance, our lighting store in Omaha can help! Stop by The Light Palace or contact us today for help finding the perfect solutions for your home!